You may have been feeling the Bern during the primaries, but you've still got to vote for someone who's actually on the ballot come November. Faced with a showdown between Republican Donald Trump and Democrat Hillary Clinton (and a couple of third-party candidates), the options for a former Berner may seem bleak. To ensure that staying home from the polls isn't an option, though, there are at least a few reasons why Sanders supporters should consider Clinton for their vote. When Sanders finally endorsed Clinton in July, after a hard-fought primary battle that lasted several months, the two politicians — Clinton a Democrat and Sanders an independent — banded together to oppose Trump. That's because, when it comes down to it, Sanders and Clinton have much more in common than either of them share with Trump. In fact, their opposition to Trump may be one of the strongest things that the former Democratic foes share. Sanders' endorsement of Clinton made it clear how strongly he opposed the Republican alternative. "That is not what our country needs," Sanders said at the time. "In these stressful times, we ought to bring our people together, not divide us up, which is what Trump is trying to do." Along with his endorsement, Sanders said that he would campaign "vigorously" on Clinton's behalf. If that endorsement isn't enough to convince you, some of Sanders' and Clinton's common ground should do the trick. During the primary race, Clinton and Sanders were at odds on this issue. 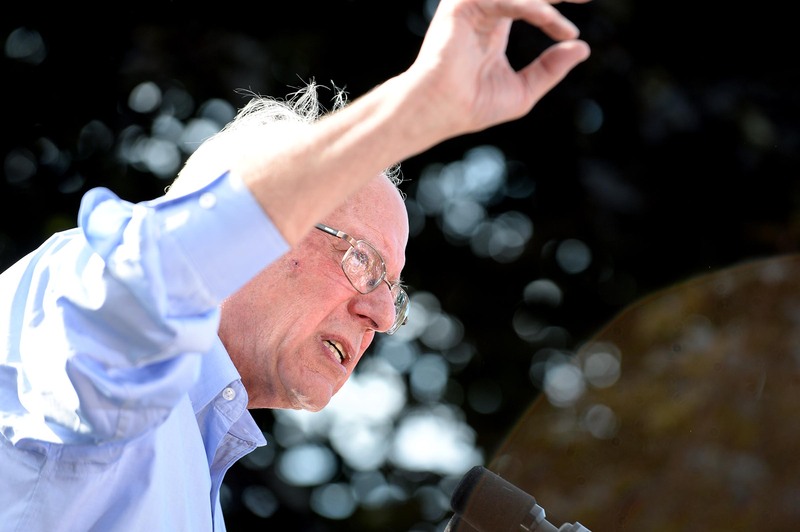 Sanders favored a $15 minimum wage, like those recently approved in California and New York. Clinton, on the other hand, has oscillated between support for a $12 minimum wage and a $15 one. Both of those wage increases, though, would be more substantial than the current rate of $7.25 per hour and Trump's lukewarmly-supported $10-per-hour wage. OK, hear me out on this one. If you watched the first presidential debate on Monday, you know that Clinton still faces tough criticism about her notorious email scandal, particularly from Trump. Sanders made it clear early on in the primary season that he was tired of hearing about the "damn emails." Chances are, you're probably tired of hearing about them as well — but it doesn't seem like Trump is going to forget about them anytime soon. Both Clinton and Sanders have supported campaign finance reform. But on the finer points, both politicians vowed to overturn Citizens United, the 2010 Supreme Court decision that allows corporations and unions to spend money to oppose political candidates. Overturning Citizens United doesn't just touch on the money involved in politics, though. It also has a lot to do with Supreme Court nominations — and Clinton and Sanders would seemingly look to nominate similar judges to the ever-important bench. When it comes to immigration, supporters of any non-Trump candidate should be able to find some common ground. Whereas Trump has flip-flopped (at best) recently on whether or not to deport the millions of undocumented individuals living in the U.S., Sanders and Clinton have long supported a path to citizenship for such individuals, and they both support the DREAM Act, which particularly aids young undocumented individuals. Sanders has served as a member of Congress since 1991. At that time, Clinton had a budding political career of her own, serving as first lady of Arkansas. Clinton and Sanders can both tout decades of political experience, whereas Clinton's opponent can't say the same. When Clinton brought up climate change during Monday's presidential debate, it was as if she had taken a note from Sanders himself. Clinton criticized Trump for previously saying that climate change was created by China, while Sanders took to Twitter to question Trump's acknowledgement of the environmental condition. In fact, Sanders' tweets during the debate often echoed Clinton's sentiments. Clinton and Sanders are both known for their feminism. During the primaries, they both pushed for equal pay and women's health reform, and they both spoke strongly about feminist issues. Even Clinton's veep pick has gotten the approval of Sanders. Sanders and Sen. Tim Kaine have served together in Congress, and while they reportedly haven't always seen eye-to-eye, even knowing that, Sanders still supports the Clinton/Kaine joint ticket. Seth Meyers, host of Late Night with Seth Meyers, may have said it best. During the Democratic National Convention in July, Meyers sent "Bernie or Bust" supporters a wake-up call. "Donald Trump is ahead in the polls. The house is on fire, stop crying because we're not putting it out with your hose," he said. Now, a few months later, the polls are neck-and-neck, and Sanders' supporters should probably take the hint. Although she's on the left of the political spectrum, there's no denying that Clinton remains to the right of her once-opponent Sanders. Still, they've managed to find some shared interests in the wake of the impending general election. Perhaps the most compelling reason for Sanders' supporters wondering whether or not to support Clinton in November is the most obvious one: She's not Trump.